A research and educational institution in Vienna devoted to dealing with Austria's Nazi past and resistance against Nazism. Apart from the archives as such there is also a publicly accessible visitor centre with an exhibition. It's not only about Austrian resistance against the Nazis but also about the whole history and the aftermath of this grim era. It's not big but a well-made exhibition that covers quite a lot of ground. More background information: The Documentation Centre of Austrian Resistance (in German: "Dokumentationsarchiv österreichischer Widerstand", hence their corporate acronym DÖW) in Vienna was first founded in 1963 – at a time when the existence of such resistance in Austria was barely being recognized. Dealing with Austria's own part of the Nazi past was also still in its infancy, if it wasn't swept under the rug altogether. Austria's dealing with its darker past is still only catching up, but things have developed a lot over the last few years. This is also reflected in the recognition and financial and moral support the DÖW Centre has received in more recent years. The initial exhibition, which had been in place since 1978, has been completely revamped and expanded, with the help of state money, and the present, modern exhibition was opened in 2005. 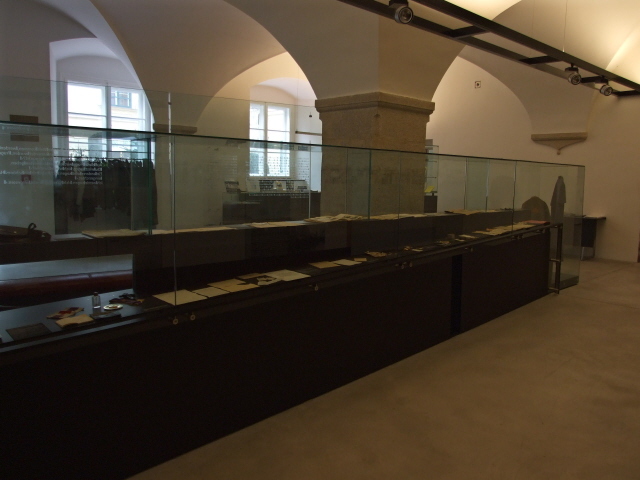 Within Vienna, the DÖW is now possibly the most important institution for archiving, researching and, especially, education about these issues. 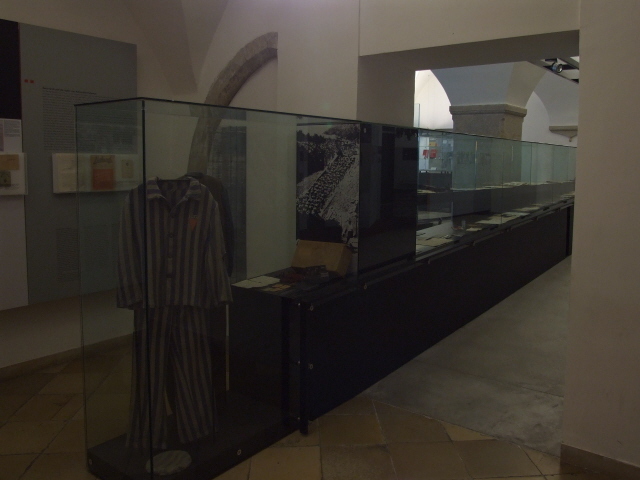 Obviously, its exhibition can't compete with places such as the memorial sites of Mauthausen or Hartheim, but given the limitations of space in particular, the new exhibition does a pretty good job. Moreover, they offer guided tours and all manner of educational programmes, including talks by/with survivors. Temporary and external exhibitions are organized too (cf. Spiegelgrund/Steinhof, Vienna). The exhibition also has an excellent online incarnation (sans artefacts, naturally, but with at least as much information) under: www.doew.at/ausstellung (>English). What there is to see: The Centre's permanent exhibition is housed in just three not so big rooms, but quite a lot of info is packed into this space. Photos and documents accompanied by explanatory texts are the mainstay of this exhibition, but there are also a few artefacts on display. The texts are in German and mostly translated into, or rendered in, English too ... sometimes in an abridged form, not as complete 1:1 translations (but the English is more or less fine). Documents themselves are not translated (but you can find the odd English language document too). As you enter the building you first pass a counter next to the coat hangers, flanked by displays of various flyers, books and other material … you can come back to this after having seen the exhibition proper. The exhibition starts, thematically and chronologically, in the room to the left, beginning with the years leading up to the take-over of power by the Nazis. Next comes the "Anschluss" (annexation) of Austria by the German Reich, the glorification of Hitler in (his home country of) Austria and the onset of suppression and persecution. This is followed by a section specifically on the Holocaust and especially the deportation of Jews from Austria. 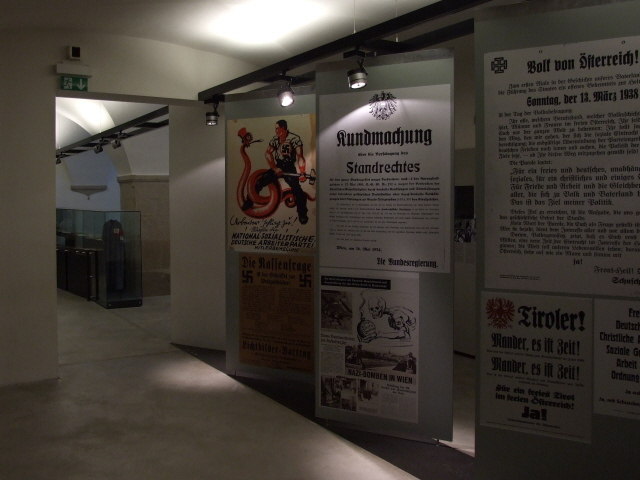 Moving on to the central room, there is a section on actual resistance in Austria – as such it can be regarded the centrepiece of this institution. It is, however, actually rather brief – though still informative. Those already familiar with the well publicized basics of Nazi and Holocaust history will find more new insights in this section than in the previous ones. What stands out most in my memory is the display of an incredibly sarcastic poem (modelled in part on the Lord's Prayer) which impressively slags off Hitler with the bitterest, biting irony. You hardly dare imagine how dangerous such resistance through humour must have been back then. There's also information on the personal fates of different people, from all walks of life, who in one way or another resisted Nazism. 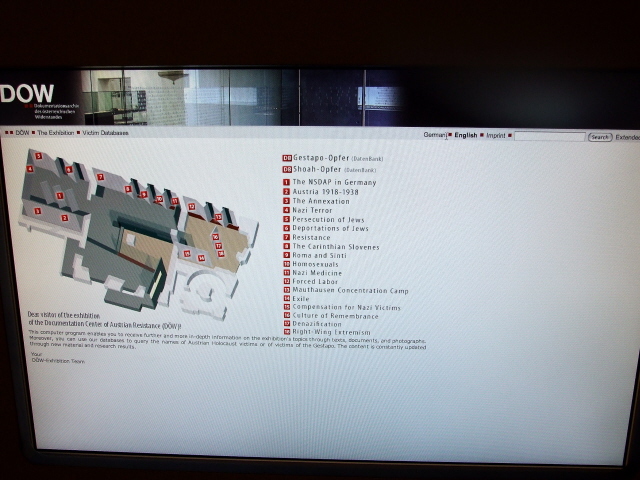 Two computer terminals provide extra information in an interactive system. The remaining sections in this room are devoted to particular groups that were the target of Nazi persecution other than Jews, esp. "gypsies" (Sinti and Roma), homosexuals and the mentally ill. (Note that the centre also helped to put together the more extensive specialist exhibition at Spiegelgrund about the Nazis' "euthanasia" programme and criminal abuse of medicine in general). The final room to the right is entered parallel to an oblong glass display cabinet with various smaller artefacts in it. 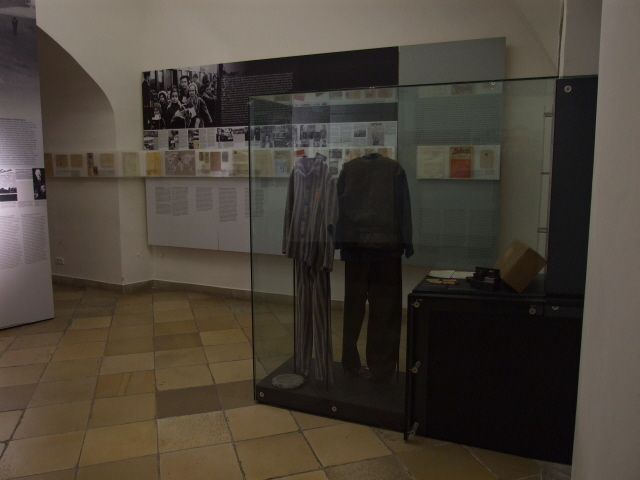 It ends in the room with a larger glass cabinet in which objects such as the clothes of concentration camp inmates are displayed. The topics picked up on the left-hand side walls are, accordingly, those of the forced labour system and concentration camps. Mauthausen is given particular emphasis here. Again, the displays are supplemented by a computer workstation offering more background information. On the opposite wall, the issues of exile (including resistance in exile) and post-WWII restitution and compensation efforts are picked up. Again, for those who have already studied the more familiar issues revolving around concentration camps etc., it is rather here that new insights are to be gained, as these topics are not normally emphasized so much in exhibitions such as this. 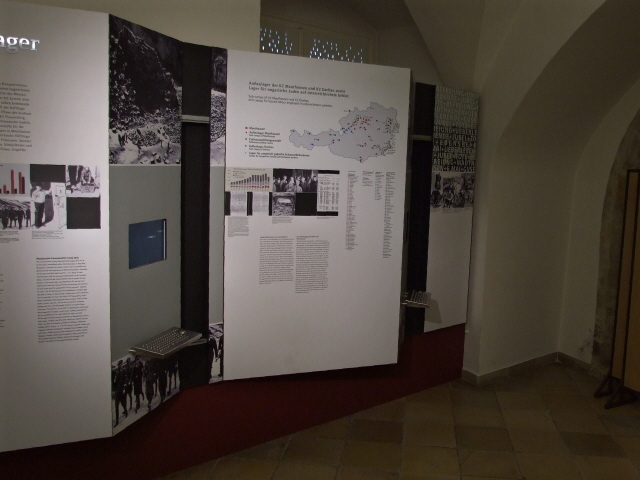 The most "difficult" and challenging section of the whole exhibition, however, is to be found on the display panels between the opposing walls in this last room: here the culture of remembrance is looked into – and: the post war and still current re-emergence of extreme right-wing neo-Nazi movements. The propaganda of e.g. Holocaust deniers is dealt with head-on. But as a visitor the exposure to such ideology still being floated today is without doubt the most uncomfortable section of the exhibition. On the other hand, it is of course possibly the most important one, esp. as one of the Centre's declared main aims is that of educating the young and countering the neo-Nazi propaganda they are sometimes again exposed to at a vulnerable age. Back in the foyer, the shelves with books, pamphlets and information material of all sorts are worth a closer look. There are also English language papers and flyers to be found here. Location: in the centre of Vienna, on Wipplingerstraße 6-8, on the ground floor of the Old City Hall building (across the courtyard in the north-eastern wing). Access and costs: centrally located, free. Details: the Centre's location right in the middle of Vienna's central First District, in the Old City Hall (Altes Rathaus) building on Wipplingerstraße, should be easy to find. But note that you have to go through to the courtyard. The Centre is housed in the wing opposite this courtyard which serves as a car park – look for the slightly incongruous modern glass panels and the door on the baroque facade. Opening times: Monday to Friday from 9 a.m. to 5 p.m., open late until 7 p.m. on Thursdays. The whole exhibition space is wheelchair-accessible. Time required: At least half an hour, better a full hour (or even more), depending on how deep you want to delve into this subject matter, whether you'd skip sections and also on whether you can read German (original documents) – and whether you want to make use of the interactive computer workstations in the exhibition (instead you could use the Centre's excellent "virtual" exhibition on the Internet). Combinations with other dark destinations: in general see Vienna – the Centre's location right in Vienna's central First District allows for easy access to all the other sites in this district, in particular the Holocaust Monument on Judenplatz, which is also a thematically related site, of course … It's literally just round the corner: as you leave the premises of the Old City Hall on to Wipplingerstraße, cross and take either Judengasse or Fütterergasse (the next alley branching off to the right) which lead on to Judenplatz. Combinations with non-dark destinations: see Vienna.